Adelaide Entertainment Centre, Wed 15 Mar. A concert by Don Henley, co-founder of the legendary Californian band The Eagles, with a handpicked band of 15 musicians was always going to be good. Henley has lost nothing of his vocal capabilities – he still hits the highest notes with ease, and he clearly enjoys playing rockier numbers. He and Glenn Frey always wanted The Eagles to be more of a rock band and he can now live out that dream. There were plenty of quieter, almost a cappella, or country style numbers that featured wonderful ensemble vocals, but the bulk of the show was firmly in rock territory. Several things stood out – Henley’s voice, the superb back-up vocals from the female chorus, a spectacular light show, and the fact that Henley himself has become quite chatty on stage – unlike the vaguely disengaged persona he appeared to be in The Eagles. He comes across now as a generous and friendly guy, humble and sincere in his appreciation of the audience’s love of his music. When he wasn’t singing he wandered to the back of the stage out of the limelight. The band ranged back and forth across four decades playing hits from the Henley canon. 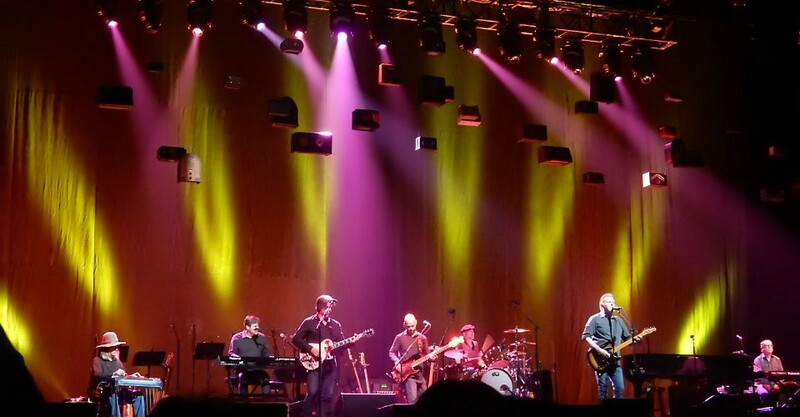 All 16 members of the band sang on the opener – Seven Bridges Road – in a thrilling start. Witchy Woman, One Of These Nights, Life In The Fast Lane, and Boys Of Summer are well known Eagles songs that got royal rock treatment. A couple of songs from his more recent Cass County album were done as duets with one of the female singers with impeccable harmony. 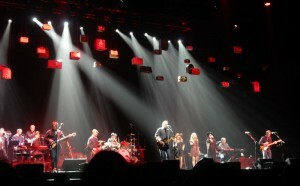 Desperado was dedicated to Henley’s recently departed songwriting partner Glenn Frey – the first song they wrote together. Hotel California got a gig, and was as good as ever, complete with duelling guitars on the closing part of the song. But I missed Don Felder and Joe Walsh. And I missed Glenn Frey. At times those absent names were very present in the memories of the earlier versions of these songs. Henley would be very aware of this of course, but all he can do is play the songs he wants to sing with respect for those who helped him get to where he is. And he does all of that in spades. He seems to have grown into something of an elder statesmen of rock as he tells the tales behind the songs with the wisdom (and occasional wit) of hindsight, and he has assembled an impressive band of musicians of all ages to bring his history of rock to modern audiences. It was a slick and polished show. The time flew by and it was all of a sudden time to bid farewell to a remarkable talent who has entertained several generations of music fans now for 46 years. And given how good he looked and sounded tonight I wouldn’t be surprised if he does it for quite a bit longer. A slick and polished show of Eagles favourites.